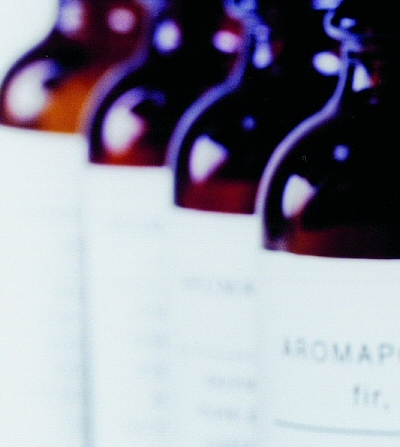 Aromapothecary transcends product and transforms clients as they are immersed in the process of customization. Upon selecting an Aromapothecary treatment or homecare product, the client completes a brief questionnaire that determines their personal blend of pure essential oils and natural ingredients. Our patent pending software program, uses sophisticated calculations and draws from a database of almost 200 different botanicals to meet the precise needs of the individual. Single note aromatics fill the air as drop-by-drop each is added to the product or treatment right before the client’s eyes to create a one-of-a-kind experience. In the Spring of 2003, the Northeast received so much rain day after day, nearly everyone in New York City was on Prozac. One particular Aromapothecary client typified the seasonal sadness that had gripped the city. Inspiring Jasmine combines with euphoric Neroli, centering Rosewood and clarifying Atlas Cedar. Excellent for not only rainy days and mondays but anything that gets you down. It’s fun to let your inner rock star out every now and then, but livin’ the life can certainly take its toll. When it’s time to disconnect from your entourage, recharge from a hard days night, or recoup from overindulgence of any variety, Quick Fix Hangover with intense Peppermint to ease queasiness, relaxing Bergamot, soothing Atlas Cedar and euphoric Neroli gives you what you need to forget the pain and keep on rockin’. Titans of industry know full well the ups and downs one can experience, sometimes in the same day, hour or minute. Riding the roller coaster is part of the job description. This, however can be physically, mentally and spiritually exhausting. To soothe and smooth the highs and lows, select Quick Fix Manic with Lemongrass and Ginger to provide an energizing boost while Damask Rose and Atlas Cedar provide balance and calm. From time to time, we all need to escape, even if for a moment or two. If you are the type that crams 25 hours in a 24 hour day, select Quick Fix Relaxing to transport you to paradise, where you can put everything into perspective with ultra calming West Indian Cedar, euphoric Neroli and recharging Mandarin and Sweet Oranges. Ever wonder what it would be like if you had chosen a different path in life? Coulda, woulda, shoulda…sometimes it takes the bad stuff to rediscover yourself. Potent Peppermint and delicate Jasmine are tied by subtle Rosewood to stimulate your mind and body to a better place. Holly Golightly, a famous fictional character once described a type of depression as “the mean reds”. She explained that with the blues, you know what’s got you down, but with the mean reds you are sad and you don’t know why. Quick Fix Uplifiting with stimulating Ginger and Lemon, intoxicating Neroli and invigorating Sweet Orange will pick you up no matter what.